Which househusband or housewife does not know the annoying cleaning of the work area behind the cooker, the tiles and their joints. 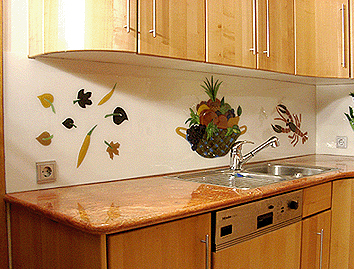 Here we offer a nice alternative, custom-made kitchen splashbacks made of glass! Whether simple or elaborately designed and cool in fusing and glass painting art. 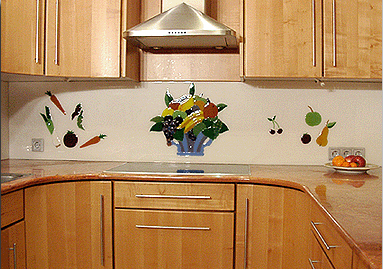 On the right are just two examples of manufactured according to customer's splashbacks. The entire surface with fused white flashed opal glass forms the base with custom requirements from Artista ®. The sockets are cut out from the base plate. Contact us, we will advise you.